Bike share company Ofo left an unwelcome parting gift as it exited the Dallas market: a heap of hundreds of its banana-yellow bikes. A photo of the massive pile went viral, prompting questions about who’s responsible for the rental bikes — and the fate of similar bike-share ventures in other cities. “Terrible,” Dallas Mayor Mike Rawlings said in a tweet that featured a photo by Robert Vandling, who spotted the tangle of bikes at a collection center run by CMC Recycling American. The recycling center “purchased the irreparable bikes as scrap metal,” CMC’s public and investor relations manager Susan Gerber said in a statement to NPR. Ofo says that as it shut down its Dallas operation, it donated usable bikes to two local causes: CitySquare and Bikes for Tykes. According to the Dallas Morning News, the company promised 250 bikes to anti-poverty group CitySquare — which has yet to figure out precisely what it will do with them. A few hundred bikes are a small fraction of the 5,000 bikes, according to the Morning News, that Ofo once had in Dallas. In the past year, Dallas emerged as a somewhat unlikely ground zero in the battle for market share among dockless bike-share companies. In the spring, NBC News reported that Dallas had more of the bikes than any other U.S. city. A city official put the number at around 20,000, KERA reported. The ubiquity and seeming disposability of the bikes in Dallas prompted hundreds of public complaints about them being left strewn across sidewalks or tossed into waterways. An Instagram account called dallasbikemess documented some of the most striking scenes. And in what police viewed as an act of frustration, someone burned at least two Ofo bikes, leaving their charred wreckage behind. This summer, as Dallas and other cities enacted laws to reign in the bikes — and as more cities approved the use of dockless electric scooters — Ofo began to shrink its U.S. footprint. 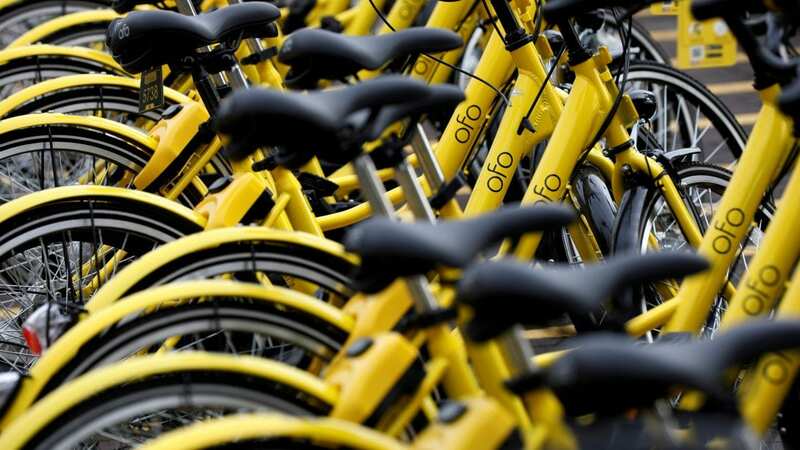 In July, Ofo shut down its Chicago program after the city changed its rules to favor short-term rental bikes that can lock to stationary objects – through a U-lock or a cable – rather than the self-contained wheel lock that Ofo and other bikes use. Ofo bikes arrived in the U.S. last summer, with an initial launch in Seattle — the tip of what proved to be a massive spear of yellow bicycles, which were soon scattered on sidewalks in cities from San Diego to Washington, D.C. Even as it retracts from some markets, Ofo is expanding in others. In late June, the company brought its bikes to parts of Miami and Atlanta. Ofo’s attempt to flood the U.S. market with $1-a-ride bikes was boosted by $700 million from investment funds in July 2017. But then complications arose — from new competition from electric bikes and scooters, to new regulations backed by city officials and activists who said the bikes were creating messy hazards. On its website, Ofo says it has a global fleet of more than 10 million bicycles, operating in at least 20 countries. Along with Ofo, bike-share companies Mobike and Spin have decided to leave Dallas — according to KERA, that leaves only Lime and the local company VBikes offering short-term bike rentals in the city.